BUILDER: John Holland Pty. 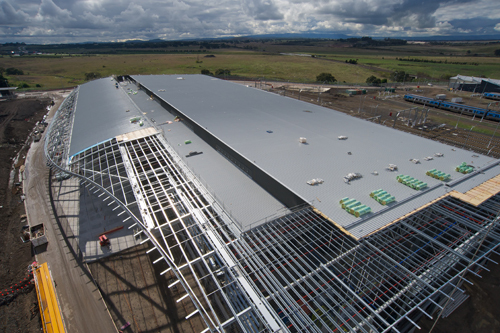 Ltd.
To design one of the largest and most modern train maintenance facilities in Australia, longer than the MCG and covering an area of almost 1.2 hectares. Originally designed by another engineer, we were brought in to redesign the project with a focus on reducing costs. Using Klopfer Dobos’ proven design philosophies we completely redesigned the structure from the ground up. We significantly scaled back the steel tonnage required and simplified the project. Whilst reducing cost we were able to engineer a building with sleek, modern exteriors and high-tech internal features, such as the train jack elevation system and roof suspended monorail beams and walkways. We also designed pits and trenches capable of handling massive jacking units able to lift the housed passenger trains. In preparation for construction, over 20,000 tonnes of rock was excavated. Employing this approach we were able to identify a number of key areas where we could significantly reduce project costs without compromising the safety or integrity of the building design. – redesigning the portal frames to reduce the amount of steel in the frames by up to 40%. These changes, combined with other changes we incorporated in to the design, resulted in steel savings in excess of $2 million dollars. Plus the end result was a beautiful, contemporary building which will serve the Victorian public for many years to come.